As I mentioned last year, I no longer provide updates in this column as it is easier for me to run a What's New Album in the Facebook extension to this website. To visit the posts, enter it by using the link button, then select Photo, then Albums, then select What's New Album. Here is a brief summary of the posts. Mar. 25 The Mahon House is featured in the website Changing Vancouver. Mar. 28 Columbia River author Bill Layman is developing the "River of Baskets" exhibit in Wenatchee. Apr. 4 I suggest that Castlegar name our riverside park after city founder Edward Mahon. Apr. 12 Aaron Shepard, who headed my trail construction crew, launches a book on the displacement of people by dam development. June 2 I feature a sketch of Edouard d'Abbadie, done by Lilette Mahon while in France in 1910, four years before he was killed in the Great War. June 5 My book on Edward Mahon is nominated for the Tourism Development Award by the Chamber of Commerce. June 22 I am preparing for a visit by Marolyn Mahon and family. July 6 A post on the Mahon visit, at Brilliant Bridge Regional Park. July 8 A post on the Mahon visit at Castlegar Spirit Square. Aug. 8 Opening of the Millennium Ponds. Aug. 31 Ospreys congregate below the Waldie Mill Viewpoint prior to their annual departure south. Sept. 22 Last photo of the lovely backdrop to the Waldie Mill Viewpoint, prior to its destruction two days later. Oct. 11 I set up a display in my basement for participants of the Great Castlegar Train Station Reunion. Oct. 26 An explanation on how I organize the Trails in Time Facebook posts. Nov. 17 My biography of Edward Mahon receives an excellent review in the prestigious publication BC Studies. Nov. 20 I add my interpretations to extracts from the journal of Archduke Franz Ferdinand on his world journey in 1893. Dec. 11 "The Green Necklace", my biography of Edward Mahon, is ordered as a gift to Castlegar House in County Galway, after which our city got its name. I submitted an article on Edward Mahon to the Editor of British Columbia History magazine last summer. This was published in the Winter issue, under the title Edward Mahon - A Talented Visionary. Andrea Lister did a very fine job with the layout as well as the cover, which contains an image that relates to the story. As she was working on it, she discovered that she is related to Edward from his sister-in-law's side. Gundrid Rebbeck married Robert Dempster in 1925. Eleanore Dempster, author of The Laughing Bridge: A Personal History of the Capilano Suspension Bridge, married Peter Dempster, Gundrid's son. Eleanore's book allowed Greg Nesteroff and me to connect with Marolyn and Bryan Mahon. The North Vancouver version of my Edward Mahon exhibit, known as Imagining North Vancouver: Edward Mahon and his Legacy, has been relocated to the North Vancouver City Hall until the end of November. The panels are displayed next to the Board Room and the Mayor's Office. The exhibit is based on my book on Edward Mahon and the Castlegar exhibit which opened here last year. Marolyn Mahon and I were invited to be special guests as part of the Culture Days celebrations on September 29. To bring the audience closer to Edward's life and personality I brought several additional elements with me. These included: two of the Castlegar exhibit panels that provided a sample of the actual photographic prints as displayed here last year, family artifacts, and a PowerPoint presentation on four facets of the lives of Edward and Lilette. In spite of inclement weather and competing events such as BC Rivers Day, the event was well attended. Councillor Don Bell, a dedicated historian and long-serving politician, was there to discuss Edward's legacy to the city, which continues to be developed as part of the 'Greenway Project' that will see new signs in Mahon Park, among other things. The Mayor's Office purchased seven copies of the Green Necklace: The Vision Quest of Edward Mahon. I have written an article on Edward Mahon which has been accepted for publication in BC History magazine. It will appear in the upcoming Winter issue. The Mahon Exhibit, which has been on display at the North Vancouver Museum & Archives from January, is being moved to the North Vancouver City Hall in mid-September. It was highlighted in Bulletin 313, issued by the Museum earlier. I will be attending a special event on September 29 at the new venue as part of the national Culture Days celebrations. Marolyn Mahon will also be there. For this event I have prepared four PowerPoint lectures on these topics: the photography of Edward Stolterfoht; Edward Mahon's interest in the Holtzapffel lathe; Lilette Mahon and Emily Carr; and Lilette Mahon and the Art in Living movement. I am also setting up a couple of my panels from the Castlegar display, remounted in easel mounts, as well as a variety of family artifacts for the one day. Staff from the Museum will help with book sales. Both Waldie Boardwalks were dismantled earlier this year by the trail society and as a consequence the Waldie Island Trail has not been fully passable for the second summer season. I would have repaired the main (Low Water) boardwalk in a week with one helper, by separating it into four sections, repairing the damaged footings, and floating the sections back into proper alignment. This boardwalk was the key feature of the trail and had historic relevance as well ecological significance. Its loss, even over the short term, is lamentable. In spite of my best efforts, little further progress has been made in completing the sequence of signs at the Brilliant Suspension Bridge. My Conflicting Visions panel was not approved by the Ktunaxa and I consequently redeveloped the text to focus entirely on the salmon fishery as it affected the relationship between the Sinixt and Ktunaxa people. I then followed through by connecting with the respected ethnographer team of Randy Bouchard and Dorothy Kennedy and they certified my text as being historically correct and politically neutral. Dorothy further edited my revised text, and that was submitted for approval, still with no resolution so far. It has been an extremely busy year for me, with many successes and heavy losses. The year saw the publication of my two books and a successful exhibition on Edward Mahon. Two years after getting started on the project, I was able to see the near-completion of my sign project for Brilliant Bridge Regional Park. I installed 7 of the 8 panels dealing with history of the lower Kootenay River. The first panel, called Conflicting Visions, has been held up by the Ktunaxa Nation. I hope to resolve the issues by a modification to what I consider to be the best panel of the sequence; otherwise I will need to choose another topic. The panels will provide local interpretive enhancement for the Trans Canada Trail. Aside from personal losses, the hardest thing to bear was the destruction of the Waldie Island Trail boardwalks. The situation was precipitated by a heavy snow-pack that combined with abnormal rainfall and questionable river flow management. In spite of these factors, the situation could have been easily avoided had someone taken the trouble to go in by boat, remove the four no cycling signs, and extend the guide pipes by about a metre. This would have been an easy task as the boardwalks, when afloat, are very stable to walk on, and there is no current. I had to do this for the footbridge posts in 1996, the previous episode of unusually high water. The 2012 river flows peaked at about 110,000 cfs. The boardwalks are only twelve years old. I designed the low-water boardwalk to allow passage on the trail until Keenleyside discharges exceed 60,000 cfs., and the high-water boardwalk would allow passage at discharges as high as 90,000 cfs. These were reasonable estimates at the time; in any case, the boardwalks would take care of themselves as long as they were not allowed to float above the guide posts and thus disengage from the guidance system. Once the water receded, sections shifted, leading to jamming, puncture of the heavy walkway by the pipe posts or bending of the posts where the stringers settled on them. Without the boardwalks, the Waldie Wetland is not passable during even moderate water levels and the status of Waldie Island Trail as a link in the Trans Canada Trail must be questioned. The other loss was not avoidable. That was the destruction of the bridge I had built below Little McPhee Creek waterfall. Beaver dams in the headwaters of that creek have failed before, leading to a heavy release of water, at times catastrophic. It is amazing that the other two bridges on Little McPhee Creek survived, as did the bridge on Big McPhee Creek. The Mahon Exhibit opened at the Castlegar & District Public Library during regular hours on August 20th, with a special event social on the evening before (Sunday, the 19th). Marolyn Mahon was in attendance. Some people were confused by this arrangement as they turned up on Monday for the special event. All the same, attendance was quite good. There will be another opportunity for a special event when the second part of the exhibit is revealed, on September 24. The repeat social will be on the evening of that day (Monday) from 6:30 to 8:30. I will be there to go over the new panels and highlight the second phase of Edward's life, starting with his wedding in 1911. Refreshments will be served. That will provide another opportunity to pick up the book on Edward, signed during the event, or pre-signed by me and Marolyn. I am selling the books directly for the prices indicated when picked up, and with appropriate postage added when mailed. They are available at the Selkirk College Bookshop also, and other outlets will be set up in the near future. It has been a terribly busy time for me as several projects competed for my time and other unforeseen developments further complicated my plans. Nevertheless, things are progressing as planned. The main focus has been the completion of my two books and the preparation of the Castlegar version of the exhibit on the life of Edward Mahon. In addition to work with the photographs and the preparation of the display panels, much time was devoted to the fabrication of five display frames. These will accommodate half of the exhibit, which will be rotated after five weeks. The artifacts in the display case will also be changed to match the story-boards displayed. The North Vancouver version of the exhibit will open on November 29. The Life and Legacy of Edward Mahon exhibit at the Castlegar Public Library will open on August 20 and run for 10 weeks, with a change-over of the display on September 24. A special opening event will be held at the Library on Sunday, August 19 from 7 to 9 in the evening. This will be an opportunity to dispense the two books which I have been working on: one on Edward, and one on my past efforts to develop interpretive trails. Marolyn Mahon will be a special guest. The Brilliant Suspension Bridge Regional Park is finally getting the infrastructure built so that I can install my sign panels that were produced last year. These will be in place after the opening of my exhibit. Difficulties in getting the first panel approved by the Ktunaxa prevent me from exhibiting Conflicting Visions until that issue is resolved. I have been pleasantly surprised and honoured by the news that this website was selected by the BC Historical Federation for their 2011 Website Award. The selection committee wished to recognize "the presentation, research, and impact of your website on our historical understanding of the region". The award will be presented at the awards banquet in Campbell River on May 5. This is an opportune time to explain the image that is used on the website entry page. It depicts a couple posing on the Dewdney Trail in the vicinity of Rossland, and is used with the permission of the FortisBC Archives. The enigmatic photograph captures the two aspects of my work: building community trails, and making them pathways into the past. This photo will also grace the cover of my book Trails in Time: Reflections, which will be published this August, along with my book on Edward Mahon. My work on the Mahon Exhibit has taken a lot of my time, but produced some exciting results. So far I have printed several hundred photographs from original negatives; of these, about 140 are suitable for display purposes. One unforeseen development was the establishment of a connection with the family of C.E. 'Ned' Pratt, Vancouver's brilliant and yet poorly known architect. I am collecting a database which will allow me to do an article on this website and a chapter in Time Windows. Ned studied engineering at UBC and was a member of the rowing team that won Canada a bronze medal in the 1932 Olympics. He moved to Toronto to study architecture and there married Catherine Lang, an Olympian in the 1936 games. The couple relocated to Vancouver in 1938. Lilette Mahon's house on S.W. Marine Drive was one of his early commissions, and he appears in the photographs. The house was radically different from conventional design and helped to usher in a new wave of architecture that combined simplicity and affordability with elegant design. In Lilette's words, Ned's conception 'brings the outside in and the inside out.' Along with other creative people, the two maintained a relationship to the newly-defined 'Art in Living' movement, which in addition to residential applications, culminated in splendid commercial buildings, notably Ned's work for B.C. Electric and the UBC campus. Ned was a senior partner in the firm of Thompson, Berwick and Pratt until his retirement in 1976. His firm employed some of B.C. 's best known architects, including Arthur Erickson. In 1962 Pratt was awarded the Massey Award gold medal for his design of the Thea Koerner Graduate Centre at UBC. Ned was killed in a car accident in 1997. With winter approaching, my thoughts turn to skiing, and the many enjoyable evenings I will be spending on developing the Life and Legacy of Edward Mahon exhibit. The material I obtained from Marolyn Mahon is pretty exciting and my time in the darkroom will be rewarding. I was surprised to find photos of Edward's West Lake operation that I have not seen before, and am offering six in the attached Gallery. They show people walking up the trail to the West Lake lodge, enjoying the winter activities in its vicinity, the vast amounts of snow that literally buried the lodge, and its comfortable and roomy interior. The brochure was developed by Florence Barr, who married Roland Brewis around 1934. The Mahon exhibit will be presented at the Castlegar Public Library from August 15 to October 17, 2012. A six month run at the North Vancouver Museum will commence in November 2012. The North Vancouver Museum maintains an excellent website: www.northvanmuseum.ca. I have been informed that the Brilliant Bridge Regional Park project, which includes my interpretive sign sequence, will be completed next year. That gives me that much more time to fine-tune my signs, whose proofs are essentially complete and ready for production. I was disappointed to learn that the Kootenay Gallery will not be hosting my exhibit on Edward Mahon. The reasons given were the gallery's change of focus to pure art displays and the relevance of Edward's work to Castlegar. I approached the City for minor financial support which would allow me to construct 10 display frames for a split exhibit, with four modules presented at the City Hall and six at the Library. A few days later I received the welcome news that the North Vancouver Museum is committing to a six month run of my exhibit, starting in November 2012. They will be hiring a graphic designer to work with me and make the Life and Legacy of Edward Mahon a state-of-the-art display, which will include family artifacts and Lilette's paintings. It is my hope that this comprehensive display will be presented at Touchstones in Nelson, as the local display will of necessity be much smaller and less ornate. The other disappointing news was that Ross Mahon will not be able to fly the Gweduck to Castlegar this year as previously planned. He is giving flying lessons and his commitment to his students is interfering with plans for the flight along the Columbia. I was honoured and grateful to be awarded a $2,000 grant by the Heritage Credit Union (Castlegar Branch) to support some upgrades to this website. The work involves replacement of the archaic operating structure, embedding of keywords for all documents, and increased security measures. The most obvious visible change will be the addition of a new submenu (Interpretive Gallery); this will display all of the interpretive signs I have developed to date. Visitation has already improved dramatically, doubling to around 250 visits per day. It seems that my vision of walking trails enhanced by interpretive displays is catching on. The provincial government is finally recognizing the value of non-motorized trails as providing affordable aerobic workouts and some funding is actually being made available to support this activity. Furthermore, a recent program on CBC's Quirks and Quarks documented how such physical activity enhances brain activity and offsets the inevitable deterioration of cognitive function that comes with aging. With my work - past and present - I tried to provide an environment which should provide maximum stimulation for both body and mind. It is shaping up to be a very busy year for me. After several delays, I was asked to complete the orientation sign for Zuckerberg Island. It has been completed by the Kelowna sign shop and I will be installing it in the frame at the entrance to the suspension bridge shortly. The panel is a composite product, incorporating a vinyl decal over a silk-screened background panel. While this work was in progress, I received a commission to do an eight panel sequence for Brilliant Bridge Regional Park, which will be similar to my Spirit Square work. The panels will be mounted in double frames, with two on one side and two on the other side of the wooden frames. The frames will be erected at the north and south approaches to the restored suspension bridge. Two additional signs are planned for the observation platform to be constructed below and downstream of the historic bridge. I have completed the preliminary proofs. Half of the panels deal with the native and the Doukhobor presence near the confluence of the two major rivers, and the other half deals with the history of the Lower Kootenay River, complementing my more extensive work on the Columbia at the other local venues. The panel titles consist of two words in each case, and include a number to encourage viewing in the proper sequence. This was a problem with my Spirit Square work, where the frame arrangement was changed by the contractor from a linear to a cluster formation, essentially making a presentation of the panels in the chronological sequence (as I designed them) impossible. Additional work will be generated by my successful application to the Columbia Basin Cultural Alliance / Castlegar Arts Council to produce an exhibit entitled The Life and Legacy of Edward Mahon. Much of the work involves printing exclusive photographs from original negatives in the family possession. Marolyn Mahon will be contributing some additional artwork and artifacts. I hope to open the exhibit at the Kootenay Gallery next year. The North Vancouver Museum has expressed an interest as well. Sharon Proctor's presentation to the Royal Astronomical Society on Edward's astronomical pursuits was attended by a full house, which included Marolyn, Ross and Lilette Mahon. Marolyn tells me that Sharon acknowledged my work on Edward's biography and the help which I had provided. The ornate log home was built in 1911 as a 'retreat house in the woods' for Edward by Japanese people in gratitude for his business dealings with them during a period of blatant discrimination against Orientals. It was eventually sold to George Herrmann who renamed the property Spuraway and developed it as an equestrian and sports centre, which attracted North Shore society. The property now lies in the Municipality of West Vancouver. The dedication will take place on April 16. Invited guests include the Mahon family, the descendants of subsequent owners, local mayors and representatives of federal and provincial governments. Unfortunately, I have medical commitments at the time. The photos show the cabin during original construction, and as I saw it in 2009. Here are a few timely updates. On the evening of January 10 I delivered a presentation to the West Kootenay Family History Society. I had been asked to talk about my efforts to increase public appreciation of our colourful history and to raise community awareness about environmental sensitivity and potential degradation through my interpretive panels on local trails and this website. The presentation was well received. On January 11 I met with BC Hydro to discuss my concerns about the perceived negative impacts on the Waldie Island heron population by the current whitefish studies. The population dynamics have been significantly altered by the studies in the vicinity of Breakwater Island, a popular roosting site at this time of the year. A further meeting is planned to see if the disruption from this operation - which is slated to continue one more year - can be mitigated. I will supply more details at a later date. Ross Mahon tells me he is hoping to visit Castlegar sometime this spring. He will be flying in with the recently-developed Gweduck, which his father Bryan had worked on for many years prior to his death in 2005. He is offering to fly me upriver and back, to duplicate Bill Layman's photography flight along the Columbia River. Ross may show up earlier as he is anxious to try out our cross-country ski trails with his friend Kathy. He is shown in the photo with his own plane. As readers of this column will know, Ross is the grandson of Edward Mahon, the founder of Castlegar. Sharon Proctor has been invited by the Vancouver Chapter of the Royal Astronomical Society of Canada to do a presentation on Edward Mahon's astronomy interests and his support of Thomas Shearman's efforts to build an observatory on Grouse Mountain. It will take place on March 10. I supplied Sharon with some additional material on Edward. My manuscript on the life of Edward Mahon is ready for submission to prospective publishers. At the eleventh hour, Sharon Proctor of North Vancouver connected with me via this website. Sharon is the wife of David Rodgers, a founding director of the H.R. MacMillan Planetarium. She was preparing an article on the Grouse Mountain Observatory, which Edward was to fund. We combined resources, and I expanded somewhat my references to Edward's astronomy interests, particularly in association with Thomas Shearman. Edward and Shearman are shown in photo at left. Sharon's work was published recently in the 'Express', a publication of the North Vancouver Museum & Archives. Two books that I have been involved with have either been published, or are nearing publication. Sensing Changes by Joy Parr was published earlier this year by UBC Press; I reviewed and commented on the chapter dealing with displacements on the Arrow Lakes. It is gratifying to see my assistance acknowledged in this prestigious work. The second work is the Atlas of the Canadian Columbia and its accompanying text narrative. These will be released as a set by Bill Layman. My contribution was pinpointing the 1962 aerial views of the Columbia on the Columbia Basin Survey maps. The Atlas matches the Weaver photographs to their locations on the maps, and presents similar current views to reflect the changes produced by the dams which so dramatically changed the river. The limited-edition set will be followed by a more affordable book on the subject in a year or so. The Brilliant Suspension Bridge was re-opened to non-motorized traffic this Victoria Day weekend. The historic bridge was constructed in 1913 by the Doukhobor community and remained in service until the 1960s. An early photo of the structure is shown below. This national historic monument is the main feature of the new Regional Park. It joins the two components of the trail network that were my main accomplishments: Waldie Island Trail and the Kootenay River trail system, of which Skattebo Reach Trail forms the mainline. The restored heritage structure is also a key feature of the Trans Canada Trail. The TCT Society has largely abandoned the Dewdney Trail route in favour of more scenic and historically valid pathways. The route that I was advocating 13 years ago has been largely adopted: from Nelson eastward via the West Arm, the Kootenay Lake Ferry, and Gray Creek Pass directly to Cranbrook. Similarly, the Dewdney has been abandoned for the vastly superior Columbia & Western rail bed between Midway and Castlegar. It remains to be seen whether the long meander through the Pend d'Oreille valley will remain as the only official route between Castlegar and Nelson. The Kootenay River trails provide a far shorter, more direct, and more scenic pathway that offers connections to multiple heritage attractions. It should be favoured by those hikers wishing to connect with these opportunities. Time and user traffic will decide. I have been too busy with work on my book and house repairs to provide regular updates. This is a retrospective glance at a few highlights. The Gweduck took to the air on May 7 from Lake Washington on its maiden flight, with a Boeing test pilot and Ross Mahon at the controls. It was the culmination of a dream that Bryan Mahon had worked on for many years before his death in 2005. The photos below show Ross working on the plane in a Renton hangar, and an aerial view of Marolyn's neighbourhood on Mercer Island. On May 9 I met up with Bill Layman and his pilot, Arnie Clarke, at the Castlegar Airport. Bill was re-photographing the Columbia River as far as its source in order to produce comparison photographs for the Weaver slides, taken in 1962. I contributed to the effort by matching the original Weaver images to exact locations on the 1949 Columbia Basin Survey Maps. Bill presented an overview of the work at the Columbia Basin Trust Board meeting, held at Golden on September 18. After taking off from the airport, they buzzed my house several times and provided me with photos; one is shown below. On August 13 the Columbia River saw some heavy traffic again, 110 years after the last sternwheeler plied these waters. Three tugs pushed a specially constructed barge with a huge turbine that was being shipped in one piece from Sao Paolo, Brazil to the Revelstoke Dam. By adjusting the relative flows of the Columbia and Kootenay rivers, Tin Cup Rapids were temporarily flooded, offering easy passage through them. In early September I visited Bill Layman in Wenatchee and Marolyn, Ross and Lilette Mahon in the Seattle area. I returned with additional material for my book on Edward Mahon. Bill toured me through some of the Wenatchee cultural exhibits he had been instrumental in developing, including the sculpture 'Coyote Leading the Salmon up the Columbia'. We hiked in Rainier National Park with Marolyn, and were treated to a supper by Marolyn's daughter Lilette. All the descendants of Edward Mahon are included in this photo: Marolyn (sitting, foreground left), Lilette and Ross (both standing) and their three children: Madelyn, Tim, and Bryan (with their father David between them). On October 2 I attended the ceremony for the unveiling of the monument to the Christian Family near the confluence of the Columbia and Kootenay rivers. I had been invited by Muriel Walton of the West Kootenay Family Historians Society for this special and moving event. Lawney Reyes, the 77 year old grandson of Alex Christian, was the honoured guest. Alex Christian was the last member of the Sinixt people to live in this area. The most moving part of the ceremony was the reconciliation speech given by John J. Verigin Jr., who apologized on behalf of the Doukhobor people for their part in the displacement of the Sinixt from the local area. The photos show J.J. Verigin embracing Lawney after his address, and Lawney in front of my sign on the Sinixt in Castlegar Spirit Square (photo courtesy of John Walton). Lawney told me that he was thrilled to see the sign about his people and that the photo of Alex on the panel was the first one of his grandfather he had ever seen. Most of my effort during the past winter season has been directed toward my book on Edward Mahon, which is presently about 70 % complete. I hope to publish the work under the title The Green Necklace: the Vision Quest of Edward Mahon. Of the 23 chapters, 4 deal with Castlegar, and 13 with North Vancouver and Vancouver, where Edward was better known. The book should have an interested audience in those places, as well as in Seattle, and to a minor degree in the UK. This work would not have been possible without the ongoing assistance of Marolyn Mahon. Marolyn has been scanning numerous family records and documents and forwarding the data to me with the help of Ross Mahon, Edward's grandson. I took the attached photo of Marolyn and Ross last August as we were touring Lake Washington. The photo will complement archival illustrations in the book. I have also been asked to develop a new sign panel for Zuckerberg Island, to be placed in a new frame beside the suspension bridge. The intent is to make the new sign complement my Millennium Walkway sequence. Recently I returned from a visit with Marolyn Mahon at her Mercer Island home on Lake Washington. While there, I thoroughly explored the basement where most of the records and other memorabilia relating to the lives of Edward Mahon and his wife Lilette are located. The house was built by Edward's only son Bryan while he was working for Boeing as a flight test engineer. I scanned and photographed much of the material so I can continue my research into the founder of Castlegar at home. It will lead to a large chapter in a book I am working on. It was Marolyn's third visit to Castlegar; she was accompanied by her daughter Lilette and grandson Tim. She had been invited as a special guest for the dedication of Castlegar Spirit Square. The photo shows me flanked by Marolyn and Tim, in front of the Foundations sign. I have completed the master proofs for the interpretive signs that I have been commissioned to do for Castlegar Spirit Square, and the work has been passed on for production in Kelowna. The project consists of a sequence of eight panels, to be mounted back-to-back in four steel frames. I decided to give each a one-word title, so the title sequence is: Confluence, Spirits, Influences, Foundations, Crossroads, Energy, Community, and Growth. The proof of Foundations is displayed here. The panels collectively represent a "tapestry" of the local flow of history, especially as it influenced the development of Castlegar. As much as possible I tried to relate the stories to our very special setting at the confluence of two major rivers, and to present a view that was impartial and historically correct. Castlegar Spirit Square will be dedicated on August 16, with Marolyn Mahon attending as an invited guest. I intend to drive her back to her home on Mercer Island and spend a few days poring over the Edward Mahon records in her possession. This evening I delivered a slide presentation entitled The Evolution of the Castlegar Townsite as a fund raiser for the Castlegar & District Heritage Society. It was well received by an audience of 40. The lecture dealt with the development of downtown Castlegar from the time Albert McCleary homesteaded here, to Edward Mahon's attempts to develop McCleary's pre-emption as a townsite named after his ancestral family home in Ireland. Mahon (photo at left) was frustrated in the fulfilment of his vision by unfavourable developments that were orchestrated by the Canadian Pacific Railway. My lecture also included a proposal to develop a mini-park in Mahon's memory and to have it connected to the Millennium Walkway by a riverside walking trail. I have been busy during the past winter on several projects which include the above, a continuation of work on the Weaver Project with Bill Layman of the Wenatchee Cultural Centre, and almost daily correspondence with Marolyn Mahon, whom I hope to visit later in the year to go over her records that relate to Edward Mahon. I have also contributed to the proposal development for the Confluence Regional Park, as well as a related park which would include the south-western face of Sentinel Mountain. Joseph Cross has completed the third in his series of the David Thompson paintings for the Bicentennial Legacy Project; it shows the Thompson party at Conway Creek, about 100 meters from Howse Pass. The herons around Waldie Island have changed their habits and seem to prefer the sheltered island over the open and exposed Breakwater Island. The greatest number I saw was 20. I suspect this winter has been hard on them. Dean Forester reported one mortality along Waldie Island Trail on February 20. Today "The Legacy of John Waldie and Sons" was officially released in Toronto, with both of John Waldie's great grandsons being present at the event. Author Ken Armson sent me a complimentary copy. The book deals with the Waldie lumber empire � mainly in Ontario � but it also includes a chapter on the local Waldies. Ken explored Waldie Island Trail with me in 2005 (See What's New entry for Sept. 10 2005). John Waldie entered the lumbering business in 1885 with the purchase of controlling interest in the Victoria Harbour Lumber Company. By his death in 1907 he was listed as the second biggest lumber operator in Canada, and he had been influential enough to advise Prime Minister Laurier, whom he considered a friend. His eldest son, William, relocated to Nelson in 1896 and acquired the Edgewood Lumber Company in 1908. The book is available from the University of Toronto Press, 5201 Dufferin Street, Toronto, Ontario, M3H 5T8, for $22.99 plus $6.00 shipping and 6% GST; or by phone by calling 1-800-565-9523. Today I completed the installation of the sign panel on the history of the Brilliant Dam at the Brilliant Rest Stop along Highway 3A. It compliments the No.3 turbine runner from the Brilliant Dam which has been set up in the same area. These additions to the popular rest area just upstream from the Brilliant Dam will provide interesting relevant information to the visitors. Jonathan Cwynar (in photo) and Wilhelm Maurer helped me with the installation work. I am grateful to Columbia Power Corporation for their support toward my efforts to highlight important events in our history through my interpretive sign panels and this website which provides additional information on each history topic. 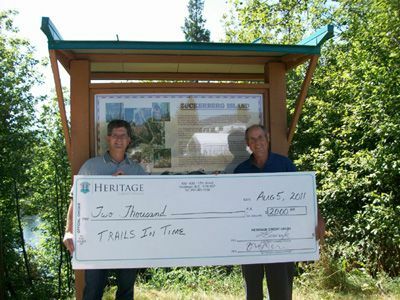 The Corporation had previously funded the redesigned Arrow Lakes sign for the Millennium Walkway, and - in 2001 - a sign on our native predecessors for Waldie Island Trail. My history essay on Brilliant Dam can be accessed directly via this link. July 28, 2007: Paving on Phase Two of the Millennium Walkway south loop extension has been completed. The gas pipeline span across the Columbia River will be dismantled once the pipeline is relocated under the river bed. Many will miss the prominent local landmark, but its removal may add available land to the park in this prime area. The Thompson Brigade arrived in Castlegar right on schedule. The vigorous river current must have been quite a thrill after three days of flat water. The six voyageur canoes will complete the last leg of the journey on Saturday at Trail. Herons have been slow in returning to Waldie Island this year; however my neighbour, Caroline Halligan informs me she has seen two adults and a juvenile. We were both shocked a few days ago to observe a boat beach on the island (near the prohibition sign) and three dogs were released for a runabout. Our concern was not only for the herons but also for a mother deer and her three fawns. Parks Canada offered their support to properly restore the Thompson plaque on the Walkway monument, after I started sending out enquiries how I could do it myself. The Park Heritage Restoration Society will send their Field Unit out to do the work in mid-August. I should be able to obtain a repair kit from them and do it in the future on behalf of Parks Canada, who own the monument. I received a call from Paul Carey of the design group working on the Twin River Estates subdivision just downstream from Kinnaird. He was interested in having me commit to the construction of a 1.5 km. walking trail through the property. Unfortunately, because of my current health problems, I had to decline. Last week I replaced the remaining faded signs on the Millennium Walkway with state-of-the-art panels that were produced by Stacy Screenprint of Kelowna. I redesigned the original signs by bringing in the graphic elements which symbolize the Columbia River; thus all my signs on the Walkway compliment the Waldie Island Trail sequence. The frames were also modified to provide adequate ventilation, offer better security and improve overall appearance. I hired Jonathan Cwynar to help me with the work, which was funded by the City and Columbia Power Corporation. I decided to alter the Star Gazer sign somewhat by reworking Thompson's map of the local area and adding Fort of the Lakes to the larger map of fur-trading posts. The Thompson Bicentennial Committee has been advised of these changes. The various celebratory developments continue. Joseph Cross has completed his second painting which shows Thompson at Howse Pass. The Columbia Brigade is scheduled to arrive at Castlegar on July 6 and do a show at Pass Creek Park at 7. The last leg of the trip to Trail commences in the morning of July 7. The progress is being mapped by GPS and can be tracked at http://www.canadianvoyageur.com/crb/route/. The City is commencing with work on the second phase of the Walkway extension, with $15,000 budgeted for the work. Hopefully the final phase next year will see the return loop completed. I received a brief visit by Bill Layman and his wife Susan, who were on their way from Wenatchee to Nelson where Bill was to talk about his work on the Columbia River. He is the author of "River of Memory - the Everlasting Columbia" and has an exhibition with the same title at Touchstones Museum. We quickly toured a part of the Millennium Walkway as Bill wanted to see an example of my signs which deal with the Columbia in the local setting. He also got me involved in the identification of geographical features and landmarks in the Weaver slide collection that he is organizing and which will be marketed by the Wenatchee Museum. It is a unique record of the river as it was in about 1962 when Weaver flew along its entire length with a crop-duster and photographed various locations. The work is particularly exciting for me as I drove part of the same route (Castlegar to Columbia Lake) a few years later, just before the Big Bend Highway was closed. It will be interesting to compare the slides I took with the aerial views. I finally launched my website article on the great blue herons at Waldie Island in order to complement the sign panel I had developed in 2004. The article was made possible by the participation of many authorities on the subject, especially Linda Van Damme, Marlene Machmer, and Wayne Campbell. It is my hope that our combined effort will contribute to raising public awareness about the vulnerability of these majestic birds in this local setting. The article can be found in the History Articles submenu, or it can be accessed directly via this link. To commemorate the opening of the new Brilliant Expansion Plant later this year, I have started a sequence of photographic displays on the construction of the original Brilliant Dam in the 1940's at the Castlegar Library. The series continue to present to the public items from the archives of West Kootenay Power & Light (now Fortis BC), in order to complement their display on company history at the Castlegar Heritage Museum. Part One deals with preliminary work such as railway relocation and improvements to the river channel. I worked on the original WKP&L display at the Museum and at that time assisted in the work associated with the relocation of the archive material from South Slocan to Trail. That gave me a privileged access to the photographic resources on file and allowed me to do intensive research into the pioneering hydroelectric development by WKP&L on the Kootenay River. On Oct.21 I was a guest speaker at the biannual Columbia Basin Cultural Conference with a slide presentation entitled River Stories-presenting local history through interpretive trails. It was well received. I felt honoured to follow William Layman of Wenatchee, Washington, whose stirring tribute to the Columbia River opened the plenary session. Bill has recently released his tribute to the river in a lovely book, which he coauthored with Eileen Pearkes. River of Memory: The Everlasting Columbia is a collection of archival photographs, tastefully combined with prose and poetry, in a marvellous attempt to fathom the nature and significance of the river prior to the changes which so drastically altered it. The book complements an exhibition by the same name which will be hosted by Touchstones Nelson: Museum of Art and History, May 5 to August 5, 2007. I was also fortunate to meet up with Joseph and Sharon Cross at the conference. Joseph is a highly acclaimed artist who has been commissioned to do an extensive series of paintings on David Thompson for the Bicentennial celebrations. The David Thompson Legacy Art Project is a monumental undertaking which will document landmark events in Thompson's travels. I spent a couple of memorable hours with the Crosses (shown in the photo) exploring the settings along the Millennium Walkway and Zuckerberg Island which would be suitable for the rendition of Thompson's presence here on Sept.5, 1811. Joseph's wonderful work can be viewed at www.josephcrossart.com. The City has contracted out for the construction of the first segment of the new extension work on the Millennium Walkway. The "south loop" segment will be constructed over a couple of years along the line indicated in yellow on the map. When completed, it will provide a setting for new interpretive signs on local history, as well as an opportunity to develop formal landscaping within the loop. This venture reflects a return to the more ambitious vision for the Walkway rather than a shorter version around the footbridge bay, which was formerly under consideration. I am developing a new orientation sign which will be installed near the main entrance next spring. The Skanska consortium is commencing with the reconstruction of the replacement segment of Skattebo Reach Trail through the Brilliant Canyon, along the route I developed with Mats Alexanderson last February. Company workers will complete the reconstruction work this summer, and the trail should re-open next spring when all construction work on the Brilliant Expansion Project is completed. Sadly, the Kootenay River trails will not be enhanced by the interpretive sign panels I had planned for them (on Ole Skattebo and the histories of West Kootenay Power & Light Co., and the Doukhobor waterline to McPhee Creek). I have been informed by the Friends of Parks and Trails Society that the signs were considered inappropriate for a natural trail, and a maintenance worry. Castlegar was honoured to receive a visit by Marolyn Mahon, who was accompanied by Eleanore Dempster, author of a book on the Mahons and family friend. Marolyn's father-in-law, Edward Mahon, was the developer of the Castlegar town-site, which he named after the ancestral family manor in Ireland. His only son Bryan died in November 2005 at the age of 92. After a relaxing luncheon, Councillor Gordon Turner presented Marolyn with gifts on behalf of the City at the Albert McCleary viewpoint. On May 24 and 25 Greg Nesteroff and I toured the distinguished visitors through local attractions that had been requested by Marolyn: The Millennium Walkway, Zuckerberg Island, The Doukhobor Museum, and Waldie Island Trail. I am working on a proposal that would see a mini-park established near the Millennium Walkway, which would honour Castlegar's founding father. It would resemble the McCleary viewpoint and include an interpretive sign, a memorial bench and some modest landscaping. In the photo, taken at my residence, Marolyn is on the left and Eleanore is on the right. I have completed my essay on the Tin Cup Rapids and added it to the History Articles section of the website. It provides additional information for the interpretive sign which I developed for the Castlegar Millennium Walkway earlier. Another addition to the History Articles submenu is an essay written by Aaron Shepard, called The Contemplative Walker. With his partners, Aaron worked on Skattebo Reach Trail in 1997 and again in 1998. He offers his reflections in this article, which was designed for publication in an environmental magazine. Aaron is currently taking creative writing at the University of Victoria, and he kindly offered his work for use on my website. I have been working with Mats Alexanderson, Project Manager for the Brilliant Expansion Project, to determine the impacts of the additional spoil storage requirements on Skattebo Reach Trail. We were able to reduce the storage requirements somewhat; however, to accommodate an additional 25,000 cubic meters of excavated material the existing face of the deposit will need to be moved closer to the Kootenay River in the vicinity of Yew Spring. This will require the relocation of around 150 meters of trail to a somewhat lower location. The relocated trail will cross Yew Spring about 6 meters from its former location, and will offer generally better views of Kootenay River. The toe margin of the deposit will be re-vegetated and trees will be planted where necessary to improve appearance. I was engaged in the process on the basis of my previous experience in the area with past trail construction and my efforts to set the mitigative standards for the effects of the construction work on the historic trail. In the photo, Mats is standing on the old trail as it crosses Yew Spring. It is now between seasons, so to speak. Although I have started cross-country skiing, I still like to go for a walk in the valley. These days I walk from my house to the Millennium Walkway and then around Zuckerberg Island and home again. It is a lovely time along the river: very quiet, except for the odd musical wave ripple and the occasional swooshing sound as a whirlpool breaks to the surface. Such soothing river sounds are at times punctuated by the sleigh-bell notes made by flocks of goldeneyes in their ever-shifting maneuvers among the sun-dappled waves. By comparison, skiing makes for easier movement- but it is through a landscape almost devoid of sound and life. The herons are back at Waldie and I have counted as many as 20 on Breakwater Island. The numbers keep shifting, as does their roosting preference: sometimes on the bleak wind-swept island beside the main river channel, and at times in the bushy lodgepole pines which encircle Waldie Island. Bald eagles are also a common sight, at times perching in trees no more than twenty meters away from my window. I am currently working on the website expansion article on Tin Cup Rapids and when that is complete I will try to produce a similar article for the Great Blue Heron sign on Waldie Island Trail. I am also sharing information on old trading posts with Andy Korsos, whom I met during his visit to Castlegar in September. Andy is producing a large and comprehensive map of old fur-trading posts as part of the David Thompson Bicentennial initiative. Thus the long winter evenings are never dull. Greg Nesteroff informed me of the recent death of Bryan Mahon, the 92-year old son of Edward Mahon, who was the founder of the Castlegar townsite. I had communicated with the Mahons during the preparation of my article on Albert McCleary. In my message of condolence to his widow, Marolyn, I did mention that I have been attempting to get the City interested in developing a small mini-park on available public land in the vicinity of Mercury Bay (near the foot of Fifth Avenue, which Mahon called Mercury Avenue). This location would be ideal for a sign on Edward Mahon and a couple of benches, and in a sense would project the Millennium Walkway along public streets to the important historic location where Albert McCleary had his cabin before he sold out to Mahon in 1891. I think it will come to pass. The recent improvements to the Millennium Walkway are very noticeable: installation of underground sprinklers, widening and seeding of the Walkway shoulders, and the planting of several new trees in the vicinity of the Arrow Lakes sign and the David Thompson Monument. We should all be proud to be living in a city that has been blessed with such a wonderful natural setting and whose management is attuned to the possibilities which exist for improving it further. In mid-September the Steering Committee for planning the David Thompson Bicentennial celebrations met in Castlegar in order to highlight Thompson's contributions and to plan further activities which will focus on this key explorer. This is an international initiative which includes the major partners of Parks Canada and their American equivalents. I was unable to attend the formal meetings because of a prior commitment in the Okanagan, but did meet with several members informally as they were touring the Millennium Walkway. Many other meetings are planned with the next one being in Spokane, followed by Toronto, Edmonton, and Pablo in Montana. Further information on this exciting celebration of Thompson's achievements can be found on the North American David Thompson Bicentennial website at www.davidthompson200.org. On September 9 I met with Ken Armson who has completed his manuscript of a book to be published under the title John Waldie and Sons - Lumbermen : A History of the Victoria Harbour Lumber Company. We toured Waldie Island Trail and looked over the remnants of the Waldie sawmill, which is the subject matter of the last chapter. Ken was associated with the University of Toronto for 26 years, where he taught courses in silviculture and forest soils. He then moved to government service, working for the Ministry of Natural Resources for 11 years, and retired from the position of Chief Forester in 1989. He resides in Toronto. Ken's interest in documenting the history of the Waldie family was initially ignited by his wife, Marjorie McLeod, who is the co-author of the book. Because of a connection by a great uncle to the Waldie sawmill operations, she started compiling genealogical data on the Waldies. They decided to collaborate on a book where Ken would be able to bring in his professional expertise. The resulting work, which is being completed by Ken after his wife's death in 2004, will be a unique amalgam of history combined with an analysis of turn of the century logging practice. Waldie Island beaches have been submerged for over two weeks now, as high water flows on the Columbia River indicate a demand for the stored water from south of the border. Discharges as high as 72,000 cfs. from Keenlyside Dam resulted in higher water in the Waldie Wetland than we have seen for the past several years. Ironically, I had been wishing for such water levels a couple of years ago when I was hoping to complete the last 2 sections of the boardwalks. The grassy shoreline of the island was previously covered by what looked like a blanket of snow: it was a profusion of daisies in bloom after the rains of spring and early summer. Herons have become more scarce. Over-wintering numbers have been greatly reduced this past winter from previous counts of between 20 and 30 to around 8. The island this summer seems to display only one regular visitor; the bird is often seen sunning itself with wings raked out at an awkward angle, panting away in the full blast of the sun. At first I thought it was an attempt at cooling down, but then seeking shade would be more effective. I suspect it may be a way to control parasites in the feathers of the inner wing area. As I am writing this, sunlight is fading and the usual heron is visible perched in a dead lodgepole pine at the upstream peninsula. Two white-tail deer emerge from the shadows of the thick forest on the island and start feeding on the exposed grassland. My attention is caught by two additional herons cruising in from the west; probably from the area near Keenlyside Dam. A noisy boat is speeding upriver, scaring the deer back into the shadows, but the herons stand their ground. Eagle pressure has been postulated as a factor behind the heron reductions. I suspect ospreys have much to do with it as well. I find that ospreys are very territorial and aggressive to any competitors. Last year I witnessed on several occasions a screaming heron pinned down in the middle of the river by a pair of ospreys that were dive-bombing the poor bird. The only escape for the heron was to gradually work its way to the shoreline and then hide under convenient bushes. I witnessed a similar attack on a bald eagle that was located on the downstream point of Breakwater Island. The eagle just ducked for the first few passes and then it got more aggressive in its response. Every time the osprey zoomed in, the eagle launched itself in the air and with heroic flapping of its wings, inverted itself a few feet above ground so its talons were presented to the attacking bird. This amazing feat of aeronautics was repeated several times. I regret to say that things are somewhat quieter here. Aside from the near-disappearance of the nocturnal heron cries, the shrill song of the red-winged blackbirds is less noticeable now. I always long to hear their notes on the waning days of winter, as they are advance scouts of the returning migratory flocks and spring must be just around the corner. During the summer, they often fly across the river from their nesting areas around the sewage lagoons to my bird feeder. The reduction in the blackbird population is related to habitat loss. Early in July the City commenced with herbicide application to the reed beds of the two smaller lagoons in an attempt to eliminate the vegetation. City concerns are based on a consultant's report which recommended the removal of all wetland and terrestrial vegetation from the berms to avoid the risk of root penetration of the clay liner. A further recommendation stipulated the elimination of burrowing rodents such as beavers. In 1998 I fought this recommendation with support of other Selkirk College faculty, and we arrived at a compromise solution which was based on selective tree removal from the berms, a commitment to beaver control, and no action on the wetland plants in the lagoons. City concerns are based on the possible weakening of the clay liner by root penetration and animal tunneling, and by the perceived invasion inwards of the reed beds, thus reducing the effective surface area for bacterial activity and interfering with the aeration system components. The lagoons are operating under maximum demand and there is little room for loss of efficiency. The larger upstream lagoon is less constrained in the operational sense and the reed beds were left intact for the time being. These are all valid arguments from the standpoint of efficiency of the treatment facility. What is not being addressed is the bigger picture. The reed beds developed naturally over time and resulted in a habitat which supports a diversity of life ranging from passerine birds and waterfowl to amphibians and reptiles. The reed beds of the lagoons support the only permanent wetland at Waldie as the other areas are subject to the extreme fluctuations of the river, and dry out for much of the year. Thus the lagoons are very important in providing safer breeding habitat for birds, amphibians and reptiles at the critical time of the year when river levels are low and ground nests are vulnerable to predators, including domestic dogs. There is scientific evidence that the reed beds are a factor in purifying the water, especially in removing toxic metals. The lagoons function as an integral component of the Waldie Wetland, with the other elements being Waldie and Breakwater islands and the main shoreline areas which are seasonally inundated. They provide balance to the overall environmental equation and are the main reason why Waldie is such a popular birding site all year. The ponds occasionally attract exotic birds which bring visitors from far and wide. 1. What is the invasive potential of the existing vegetation (mostly cattails) into the deeper water of the lagoons? 2. What happens to the existing roots of the killed plants as they decay, in terms of possibly increasing leakage potential through the clay liner? 3. How many other comparable sewage treatment facilities support bird-watching opportunities? I would welcome any assistance readers may provide in terms of answering these key questions. Earlier this year I received a telephone call from Ken Armson in Toronto. He is writing a book on the history of the Waldie sawmill operations on Georgian Bay and he was quite happy to see my article on the Waldie Mill in Castlegar on the website. He sent me an outline of his book and I sent him a collection of scanned images of the local Waldie sawmill as well as diagrams of the site. The book will be over 200 pages long and bear the title John Waldie and Sons - Lumbermen : A History of the Victoria Harbour Lumber Company. The work will reflect the combined effort between Ken and his late wife Marjorie McLeod, who died March 23, 2004. She did extensive genealogical research on the Waldie family and Ken is looking after the forestry aspects and the mill operations. The book will include a chapter on the local Waldies and their mill operation. I have been promised a copy once it is published. Ken tells me that the Ontario Waldies operated three different sawmills on Georgian Bay and were at one time the second biggest lumber producer in Canada. William Waldie Sr. was John Waldie's son who moved west and initially settled in Nelson in 1896. The first thing worthy of mention is of course this new website. When I left the Friends of Parks and Trails Society I decided to bring all my existing material from the Society site, that I had developed, to a new site which will allow me to continue my work in a somewhat different way and to retain a voice in community affairs. The site is geared to providing additional information which will make the exploration of local trails more meaningful to the thoughtful user. Visitors familiar with my material as it was presented on the FPT site will notice a few changes. For better image quality and improved operational characteristics, I have re-scanned all the images for the original history articles; some old images were replaced and new captions were written for all. Linking methodology was totally replaced for the original material. There is an entirely new section which deals with the construction history of the trails I have built, with numerous photographs as well as acknowledgments. I have organized all my history essays into a new section which is simpler to use for a visitor who is interested in history only. Thus there are three entrance menus which allow the user to go directly to the main interest category. There are also a couple of new trail descriptions and a What's New column which will allow me to keep in touch, spread the news, promote ideas, ramble, and reminisce. I hope to update this column on a monthly basis. Plans for future improvements include a monthly feature photograph from my history resources and a listing of un-official rambling trails and bushwhacking adventures. I have tried to avoid the "bells and whistles" which in my opinion are no substitute for accurate information and sound writing; thus the site may appear plain and uncluttered. The photographs are presented at a reasonable quality which is determined by the quality of the original and limitations of downloading time. Generally, better-quality photographs will be available to approved end-users by special request. In conjunction with this work, I must express my gratitude to Aquila Networks (now Fortis BC; previously Utilicorp, and before that, West Kootenay Power), and especially Hugh Barbour for allowing me free access to the West Kootenay Power and Light Archives. This relationship started several years ago when I was researching the history of Ole Skattebo and ended up as post-contact historian with the Slocan Pool Advisory Committee for Columbia Power Corporation. I was invited by Hugh to participate in the preparation of the West Kootenay Power history display for the Castlegar Museum. That process in turn led to my perusal of hundreds of prints and - a bit later - thousands of negatives, which I was asked to sort out. As many of these did not exist as prints in the archive collection, I printed up a reference set of the most interesting ones and have been drawing on these for my continuing study of the company history and as a basis for thematic displays at the Castlegar & District Public Library. Three photographs used for this website are courtesy of Fortis BC. The main entry page shows a couple posing on the Dewdney Trail somewhere between Rossland and Trail. The fisherman on the history entry page is of course Ole Skattebo; this however is an archive copy of the original print, a copy of which was presented to me by Ken Staite. Ken volunteered personal recollections of Ole as well as photographs taken at Slocan Pool after he read a paraphrased version of my story on Ole that was published in the Aquila newsletter. The photo of myself is from a photo-shoot by Ursula Heller, which was commissioned by Aquila Networks. The sequence was taken on the now-closed segment of Skattebo Reach Trail through the Brilliant canyon, and has some nostalgic significance, as this particular portion of trail has been lost. I must also express my thanks to Donny Osachoff - one of the original volunteers for the Waldie Island Project, who had long ago traded in his chain saw for a computer and has never looked back. He is a very capable webmaster, and the slick functionality of this site is a reflection of his skill. We will continue to work together at improving it further. Immediate future improvements will be in completing all site-specific image links for my interactive map of the Kootenay River trails with digital images. One more note. As the former FPT site consisted entirely of documents and images provided by me - most of which have been relocated to this site - I decided to incorporate the accumulated visitor count within the counter for this site. I have been working with the City of Castlegar to re-construct the Tin Cup Rapids sign for the Millennium Walkway. The original sign was burnt last Halloween and as the company which produced all the signs I did for the Walkway is no longer in business, I had to build up the design work from my records. As every cloud has a silver lining, this escapade was turned to advantage by giving me an opportunity to redesign the sign and incorporate the graphic elements of my Waldie Island Trail signs, thus making it much more attractive. The new design includes the wave motif (which symbolizes the Columbia River) and border. The sign itself is of far better quality as we went back to silk-screening technique for the actual production by a sign shop in Kelowna. Carl Stacy, who produced the sign for me is actually from a pioneering Renata family. I also modified the sign frame to allow better ventilation as the cedar frame absorbs moisture which gets trapped in the space between the sign and the protective Lexan panel. The sign advertises the FPT website as a source of additional information; this is not strictly correct as the article I plan to do next fall will be located on my own site; however the Friends will link to it. The City has committed $ 30,000 to extend the Walkway, for the second time since its original construction. This time the new work will incorporate a loop from the south end of the Walkway which will circle back to connect with the existing pavement near the relocated David Thompson monument. The funding will pay for grading and paving and no lights will be installed on this segment. P.S. - Due to increased asphalt costs, the City has deferred the proposed expansion until next year. This year's funding will be spent on installing irrigation to key areas. The decking of the trestles on the Columbia & Western Rail-Trail has now been completed. Bull Dog Tunnel is temporarily closed because there has been a small collapse which resulted in a pile of rubble. This will be removed soon and replacement cribbing timbers will be installed to render the tunnel safe again. P.S. - As of early July, the damage to the tunnel has been repaired. As much of the old timber cribbing which protects unstable areas of the tunnel is nearing the end of its service period, its integrity remains a liability concern over the longer term. The Boundary Rail Trail is scheduled to be opened to the public by the end of August. Incidentally, while working through the West Kootenay Power & Light Archives, I stumbled on a volume of correspondence relating to the construction of the Cascade Water, Power, and Light Company plant in the Kettle River gorge. Most of it documents the efforts of William Anderson, the chief engineer in charge, to see the project through to completion in spite of the impediments set up by the somewhat recalcitrant English Syndicate. A lot of the correspondence was via telegram by means of an intriguing code. In this correspondence record is a letter dated January 26th 1900 addressed simply to Olof Olson, Bull Dog Tunnel, in which Anderson inquires if Olson would be willing to accept the contract for the tunnel alone in the tender offered previously. Olson was the contractor for the Bull Dog Tunnel at the time and was here quoting on the diversion works for the Cascade Plant. As finally built, this included a diversion tunnel which passes under the Columbia & Western Railway, followed by a long rock-cut sluiceway that ended in a bulkhead to which twin wooden-stave penstocks were connected. The remnants of this historic plant are fascinating to explore. Some will probably disappear if the new hydroelectric project, which the area residents are fighting, will go ahead. Recently the Nature Trust of B.C. announced publicly their newest property acquisition in the Castlegar area. This is a 52 hectare tract of land directly above Robson (its location was incorrectly described as being north-east of Castlegar) which Columbia Power Corporation had acquired to accommodate the corridor for the Arrow Lakes Generating Station transmission line. This is the second land acquisition by the TNT in the local area, the other being Waldie Island. In conjunction with the latter matter, I was shocked to read the description of Waldie Island Trail in the current Visitor's Choice tourist guide for Castlegar. I would expect a publication which is geared toward promoting area tourism to be accurate. The author of the article claims that Waldie Island Trail was acquired by Ducks Unlimited. This is quite an outrageous statement and presumably derives from the participation by Ducks Unlimited in the purchase of Waldie Island. As I was heavily involved in that transaction, it may do some good to go over the details. In May 2002 I was approached by Ed Beynon of the West Kootenay Naturalists who was concerned that time was running out on the option for the Columbia Basin Fish and Wildlife Compensation Program to purchase Waldie Island from Charles Salisbury and his partners. I called John Krebs, the senior wildlife biologist for CBFWCP and got from him the sense that there was some question of ongoing commitment. This puzzled me, but I told him to reactivate my February 1998 application on behalf of the FPT Society. Later I found out that West Kootenay Naturalists had in fact not submitted a formal application, but rather expected the consultant hired by BC Hydro to study the herons to see the matter through. At any rate, the FPT Society was re-engaged in the process on the basis of the previous application. A few days later, Don Peterson called me and asked me for an information package on Waldie which he would be willing to present at the regional conference of Ducks Unlimited Canada at Merritt. On the following Monday, I received a call from Brad Arner, regional manager for DUC, telling me they would be willing to offer $ 3,000 towards the purchase. He also suggested I call Kindy Gossal at the Golden office of Columbia Basin Trust. My conversation with Kindy was followed by a teleconference between the stakeholders and by the following day I was informed that the deal was done. Brad Arner drove up from Kamloops to inspect the site, and he was very impressed with all the accomplishments. I was involved with the due diligence studies by the TNT and in the preparation of a provisional Management Plan for the island. The deal was finalized in the fall, with the four financial contributors committing close to $ 5,000 apiece. Next spring I produced and installed the signs for the Nature Trust on and near the island. The official commemoration of the acquisition was on June 14 2003; it was held in conjunction with the regional conference of DUC being held at Castlegar. Don Peterson asked me to organize small group tours of Waldie Island Trail for the participants prior to the ceremony which was to include the unveiling of the sign beside the footbridge. Selkirk College provided additional student workers as tour guides. Discussions with Barry Bartlett, who was in charge of publicity, led to the final plan for the event. Logistics for the guided tours precluded it becoming an advertised public event, as it would not be possible to accommodate extra participants and members of the first tour group would be kept waiting too long for the tours to complete before the ceremony could begin. A last minute glitch developed when Barry did not bring the brochures on Waldie Island Trail for the participants (the janitor at the CBFWCP office had thrown them out) and I had to scramble home to run off copies. Thus I did not have the opportunity to talk to the guests prior to the commencement of the events. This led to an embarrassing situation during the dedication speech when TNT Director Carmen Purdy asked for a show of hands of the FPT Society members present. Of course I was the only one, as the other 2 executive members I had asked to attend could not make it, and we did not open it up to the general membership for reasons given above. It all worked out fine in the end and Linda VanDamme insisted on treating me to lunch. The next Monday I received an email from Brad Arner in Kamloops saying that all my work for the Waldie Project had not been sufficiently recognized during the ceremony; however, I did not feel slighted in any way during the proceedings. Thus the role of Ducks Unlimited was pivotal in the sense that their efforts helped me to get the ball rolling, and their enthusiasm was transferred to the other stakeholders. But they do not own Waldie Island Trail. Even the island itself - owned by the Nature Trust - has been leased to the Ministry of Water, Land & Air Protection for 99 years so that TNT does not need to worry about liability insurance or property taxes. The photo below was taken during the dedication ceremony. Standing, from the left: Mayor Mike O'Connor (City of Castlegar), Jim Hope and Carmen Purdy (both from the Nature Trust of B.C. ), Don Johnston (Columbia Basin Trust), Gary Birch (BC Hydro), Gordon Zaitsoff (RDCK Area J), Don Peterson (Ducks Unlimited Canada). Kneeling, from the left: Ed Beynon (West Kootenay Naturalists), myself, Wayne Stetski (Ministry of Water Land and Air Protection), John Krebs (Columbia Basin Fish & Wildlife Compensation Program), Ian Barnett (Ducks Unlimited Canada).